The Joint admission and matriculation board is organizing a forum for all 2017 candidates. The purpose is to sensitize the candidates on how the newly introduced Central Admission Processing System (CAPS) works. The Board in the discharge of its mandate has developed the Central Admissions Processing System (CAPS) to automate the admission exercise starting with 2017/ 2018 Academic Session. -Provide credible and easily accessible Data for Research & Planning. 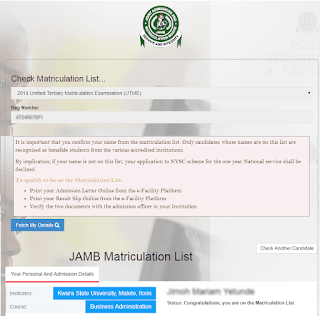 JAMB CAPS introduces some innovations to achieve the above objectives, particularly the active participation of candidates in the Admissions Exercise. It is in the light of this, that the Board provides below the Step-by-Step Process Flow of the Admission Exercise for the education and information of general public and the stakeholders, particularly the Candidates. Invitation to Participate in Sensitization Forum for Interested Candidates on Central Admissions Processing System (CAPS). As part of the Board's efforts to familiarize the candidates with the Admissions Process on the Central Admissions Processing System (CAPS), particularly their rights to fair treatment and active involvement in decisions about choice of institutions and programmes, a Sensitization Forum has been planned with windows of participation: physical attendance at the venue, through online steaming, webinar and the phone-in segment of the Live Broadcast on the NTA Network. JAMB invites interested candidates to participate in an optional Sensitization Forum on CAPS. Details are also provided below. The Live Broadcast on the NTA Network is to allow candidates watch the event at home from any location in the country and participate through phone calls to the dedicated lines that will be provided on the TV screen during the live coverage. All interested candidates are required to visit http://caps.jamb.gov.ng/candidateregistration.aspx to register for participation, which is only open to candidates qualified for Admission consideration in the 2017 / 2018 Admission exercise. Limited spaces are available for candidates that desire physical attendance at the ICC, so requests will be treated on the basis of first-come-first-served.